Hystax, a leader in Live Cloud Migration and Disaster Recovery, announces Global Availability of Hystax Acura Live Migration to Alibaba Cloud, an automated solution to bring business applications to Alibaba Cloud with consistent background replication and instant launch of workloads on a target site. Over the course of company’s strategy, supporting true any to any Cloud migration solution, Hystax, a provider of Cloud Migration and Disaster Recovery software, has announced public availability of Hystax Acura Live Migration to Alibaba, truly unique and the only fully-automated solution that supports native Alibaba Cloud infrastructure. Increased market demand for migration business applications to Alibaba Cloud became strongly evident. Alibaba Cloud is leading cloud provider in China becoming global with 19 data center regions and 52 availability zones. 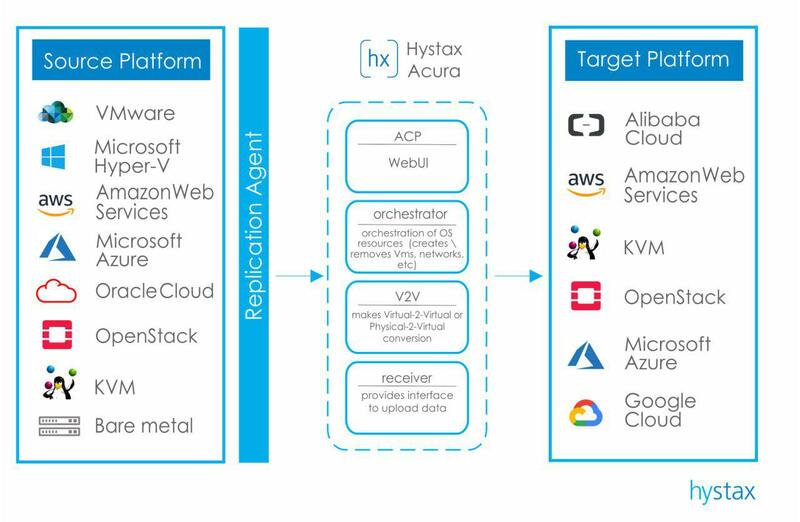 Hystax Acura enables companies to migrate even the most complex workloads to the fastest-growing and China’s most advanced and largest Cloud Provider without downtime or data loss. Alibaba Cloud provides high-performance cloud technology and Hystax is the only vendor with native Alibaba Cloud support providing unique fully-automated solution to migrate to Alibaba Cloud. Hystax Acura makes cloud migration a simple and straightforward process. Hystax Acura Live Migration to Alibaba Cloud provides an ability to manage replication settings and consistently replicates all business applications and data and send deltas to Alibaba Cloud using unique deduplication technologies. Test migrations help to configure IT workloads settings (CPU, RAM etc.) and build confidence in a migration process before performing the final migration and switching from source platform to Alibaba Cloud. Machine data is replicated from source platform and is automatically generated in a Migration Plan that supports orchestration settings and dependencies between components of business application. Hystax Acura Live Migration to Alibaba gives an opportunity to the companies to get the industry-leading cloud migration solution, modernizing cloud strategy with key digital transformations. Hystax is a provider of Cloud Migration and Disaster Recovery software, company focusing on consistent replication of IT workloads and providing fully-automated any-to-any live cloud migration and Best-In-Class Disaster Recovery. For more information visit our website at https://hystax.com or contact us via sales(at)hystax.com.